A story brimming with romance and bubbling faith, When Hope Blossoms will transport you to a mothers mind searching for new beginnings, fresh starts and unexpected romance. Amy Knacstedt has to move. Her husbands suspicious death forces her and her children to escape the hostility in search for new beginnings. Weaverly in Kansas becomes their new resting place, but unfortunately there hopes for an easy life are short lived. Next door neighbour, Tim Roper, is not pleased to have a Mennonite family living next to his apple orchard. The children try to befriend but Tim resists. After leaving the Mennonite faith years ago, Tim wants to keep them firmly in the past. But when Amy and Tim start to bump paths things get complicated. Will this relationship blossom into love or wither into hatred? Kim Vogel Sawyer is the author of nineteen novels, including several CBA and ECPA bestsellers. Her books have won multiple awards. Kim is active in her church, where she leads womens fellowships and participates in both voice and bell choirs. In her spare time she enjoys drama, quilting and calligraphy. 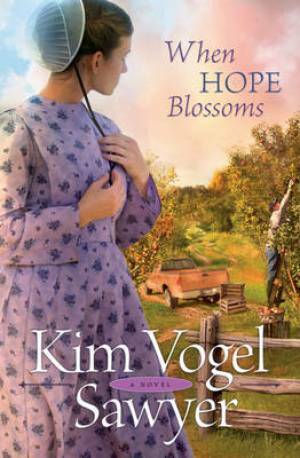 When Hope Blossoms by Kim Vogel Sawyer was published by Baker in August 2012 and is our 44438th best seller. The ISBN for When Hope Blossoms is 9780764207877. Be the first to review When Hope Blossoms! Got a question? No problem! Just click here to ask us about When Hope Blossoms.